1. Martin SA et al. Prevalence and factors associated with uncomplicated storage and voiding lower urinary tract symptoms in community-dwelling Australian men. World J Urol 2011; 29(2): 179-84. 2. Rom M, Schatzl G, Swietek N et al. Lower urinary tract symptoms and depression. BJU Int 2012(110): 918-921. 3. Roehrborn CG. Current medical therapies for men with lower urinary tract symptoms and benign prostatic hyperplasia: achievements and limitations. Rev Urol 2008;10(1):14-25. 4. Verhamme KM, Dieleman JP, Biemink GS, Bosch JL, Stricker BH, Sturkenboom MC. Treatment strategies, patterns of drug use and treatment discontinuation in men with LUTS suggestive of benign prostatic hyperplasia: the Triumph project. Eur Urol 2003; 44(5):539-545. 5. McVary KT et al. AUA Guideline for the Management of BPH. AUA 2010. 6. Roehrborn CG et al. AUA Guideline for the Management of BPH. AUA 2003. 7. Roehrborn CG, Gange SN, Shore ND, Giddens JL, Bolton DM, Cowan BE, Brown BT, McVary KT, Te AE, Gholami SS, Rashid P, Moseley WG, Chin PT, Dowling WT, Freedman SJ, Incze PF, Coffield KS, Borges FD, Rukstalis DB. 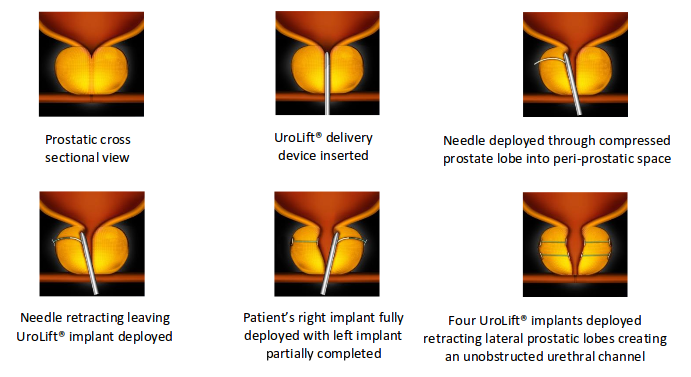 Multi-Center randomized controlled blinded study of the prostatic urethral lift for the treatment of LUTS associated with prostate enlargement due to BPH: the L.I.F.T. study. J Urol 2013: Jun 10. pii: S0022-5347(13)04597-7. doi: 10.1016/j.juro.2013.05.116. 8. McNicholas TA, Woo HH, Chin PT et al: Minimally invasive Prostatic Urethral Lift: surgical technique and multinational study. Eur Urol 2013(64): 292-299. 9. Barkin J Giddens J, Ineze P, Casey R, Richardson S, Gange S. UroLift system for the relief of prostate obstruction under local anesthesia. Can J Urology 2012;19:6217-6222.